Famous people born on OCTOBER 28 could be Scorpio who are obsessive or compulsive. This could be a good thing or this could take a turn for the worse. Normally, they’re heading in the right direction but sometimes, they get off track. This could be discouraging but they are no quitter. It’s difficult for someone like them to admit or accept defeat. Famous October 28 celebrities could also be bullheaded about certain things. Rebellious is the name that is given to them when they question someone’s authority. They question it because often times, they feel that their way is the only way to accomplish something. They set exceptionally high standards and expect people to succeed when most average people would fail. When it comes to love and romance, they’re the same way. Perhaps looking to someone like themselves such as another Scorpio would prove beneficial to them in the love department. Someone who understands them is likely a mirror image of them. Their family and friends matter to them a lot. Famous people born on October 28 find that traditional values work for them and they will likely pass those ideas to their children. 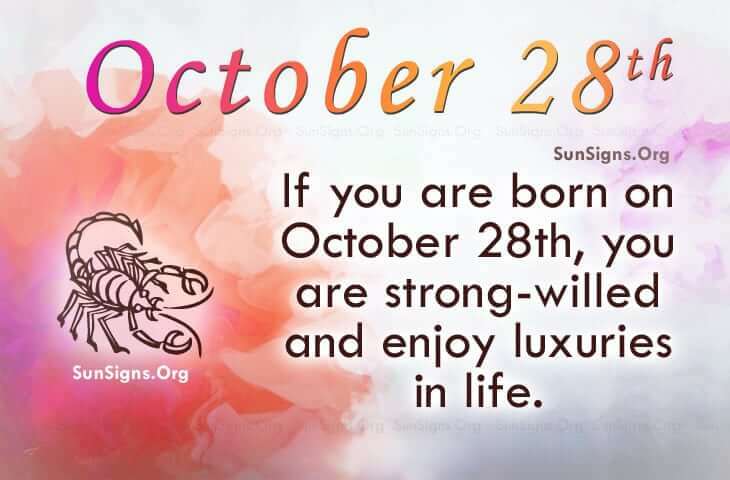 Famous people born on OCTOBER 28th are Scorpio who are strong-willed but they work to have the finer things in life. They may have to redo things to suit their liking but they get it done. In love, they might not be so successful.